63 Matt Burton (HondaRS150CRF) was right up there with 2 3rds and a 2nd place finishing 3rd on the day. #80 Colin Berry (Supermono197) had a good day finishing 5th on the 197 Supermono. #8 Kurt Wagus (BBE Honda CB150) has arrived in Superlite PRO pushing #169 Ian Gregory all the way and besting him in race 3 for his first race win in the Pro class. 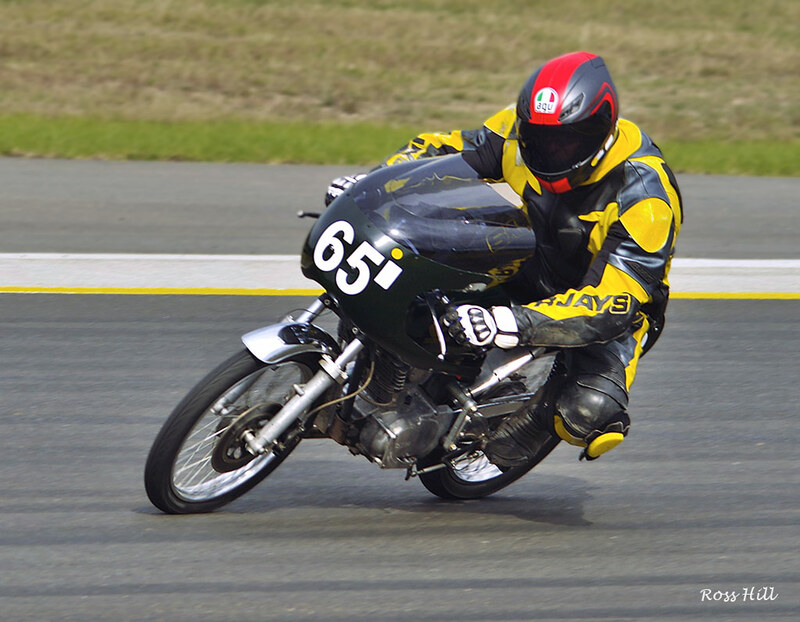 #65 Tim Smith (Honda CB150) had consistent results warding off the challenges from John Olip and Junior Murphy to finish 3rd on the day. 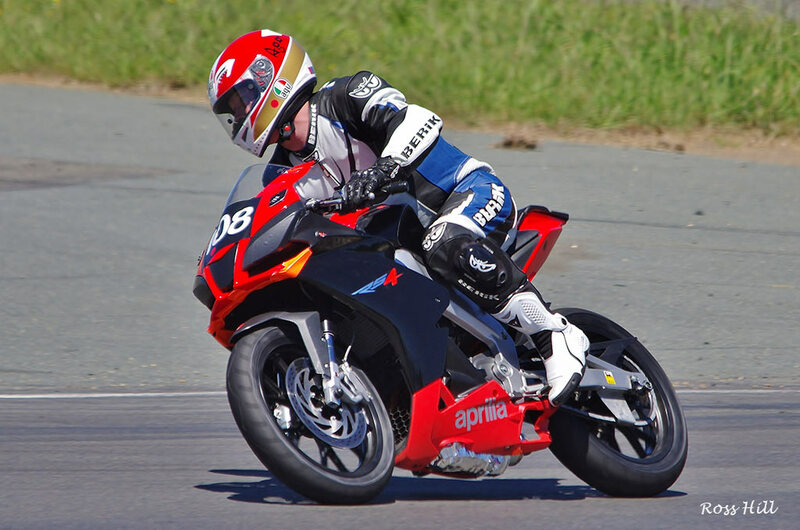 Rookie #247 Andrew Smith (Honda CBR125) acquitted himself well running with the leading group of AMs and finished sixth overall gaining some valuable experience. Adam will be competing in the Commuterlite Pro class in 2015. Round Three. 13th June 2015. 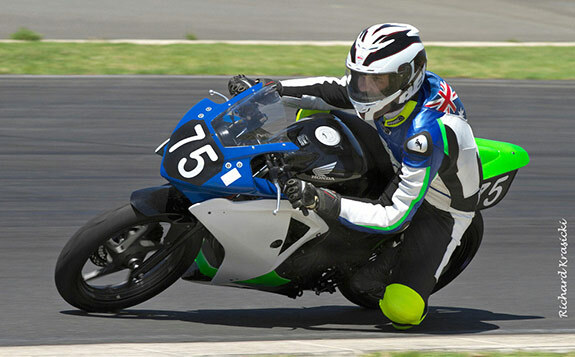 Round three held on the full GP circuit at Sydney Motorsport Park. 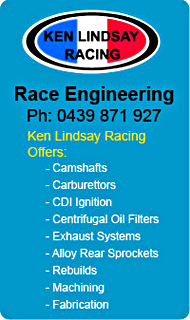 The Race meeting was held on Saturday the 13th on a pleasant winters day at Sydney Motorsport Parks full GP circuit. Track temperature was good and the Bucket racers put on some very close and exciting racing. The Commuterlites leading bunch was up to ten bikes, sometimes four and five machines across the track, shades of Moto3. Excellent to watch. 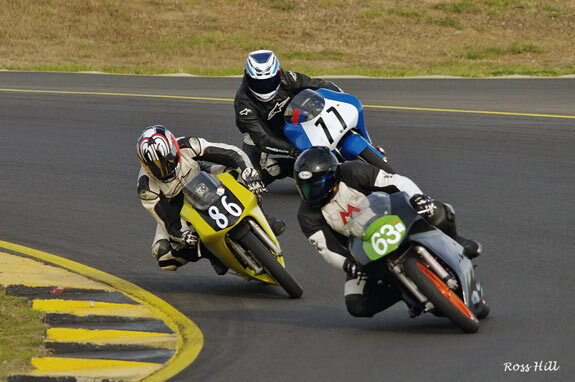 A large field of bucket racers get away in race 3 of round three up at Eastern Creek. 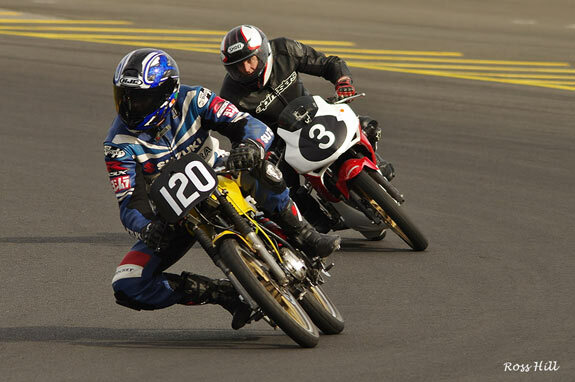 A few notable Motolite riders Jason Dunn and Shane Wilcox were missing from this event at SMP for round three of the PCRA BRA club championship. The racing was close with #77 Christopher Jones (BBE engines Honda RS150CBR) and #63 Matt Burton (BBE engines Honda RS150CBR) both finishing on the podium. 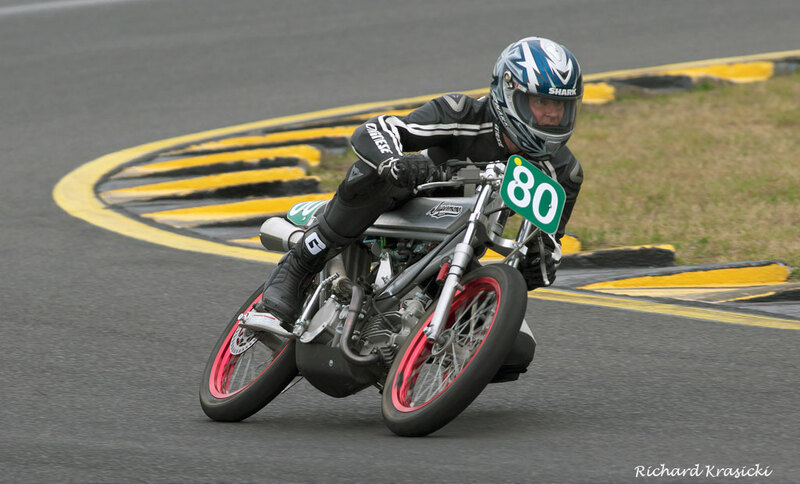 #86 Anthony Marsden was in scintillating form winning all three Motolite races and gaining the Motolite Championship lead. He didn't have it all his own way though as he was pushed by #77 Chris Jones in race one and two and by #63 Matt Burton in race three. Number 86 Anthony Marsden (Chris Sculley Honda RS85cr) starting from pole position got away to a slow start with #63 Matt Burton (BBE Honda RS150CRF) and #77 Chris Jones (BBE CBR150) getting flyers but by turn Three Anthony was in the lead which he held until the end. #63 Matt Burton was showing good pace in second place but was being harassed by #77 Chris Jones (BBE CBR150) on the the blue Honda powered machine, Chris taking 2nd place on the final lap. #32 Marty McGauley (Honda CRF150r)who is really enjoying the change from two stroke to four stroke power finished 4th. 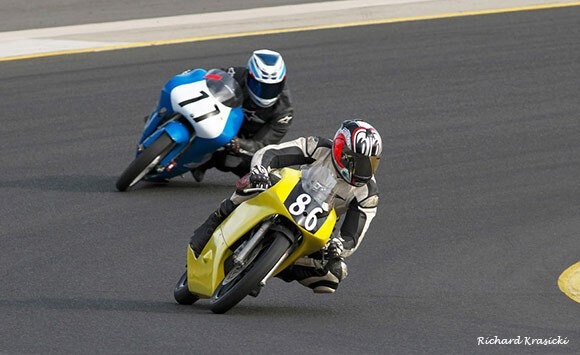 #80 Colin Berry (Supermono150) hustled to 5th place with Motolite rookie #64 Clark Russell (Honda 200) 6th and #81 Robert Tisdell (Yamaha FZR150) 7th. As in race one Anthony stormed into an early lead never to be headed. The duo of Chris Jones and Matt Burton battled for 2nd place with Chris getting the upper hand and Matt coming in 3rd. Marty McGauley had a untroubled run to 4th place whilst newcomer #64 Clark Russell (Honda 200) finished an excellent 5th in only his second race at the creek. #170 Michael Child (Supermono 197) came in 7th with #81 Robert Tisdell (Yamaha FZR150) 8th. Both #63 Matt Burton and #77 Chris Jones beat #86 Anthony Marsden off of the start making Anthony work hard for this race win. However Anthony was in the lead by Lap 2 and as with the previous races he held the lead to the flag making it 3 out of 3 wins for the day and is now leading the Motolite championship. #63 Matt Burton who had to give best to Chris Jones on the two previous races was having none of it for race 3 finding a bit more pace to run a close 2nd., pushing Anthony all the way, his best result in Motolites. Running in 3rd place throughout the race #77 Chris Jones couldn't reproduce his earlier pace and had to settle for 3rd to come in 2nd on the day also his best result in Motolites. #32 Marty McGauley had run 4th all day and finished 4th for the day and is 3rd in the Motolite Championship. #80 Colin Berry came in 5th followed by #170 Michael Child and #81 Robert Tisdell who picked up some special bits to speed up his Yamaha so we can expect to see him towards the pointy end next time out. Motolite race three #63 Matt Burton leads #86 Anthony Marsden and #77 Christophe Jones in their three way battle with Anthony being made work hard for the win. Matt was 2nd with Chris 3rd in race three. This year so far #169 Ian Gregory has dominated the Superlite Pro class with his regular sparring partner and defending Champion Junior Murphy having various bike problems. It's fallen on the fast improving Kurt Wagus to mount a serious challenge to Ian. 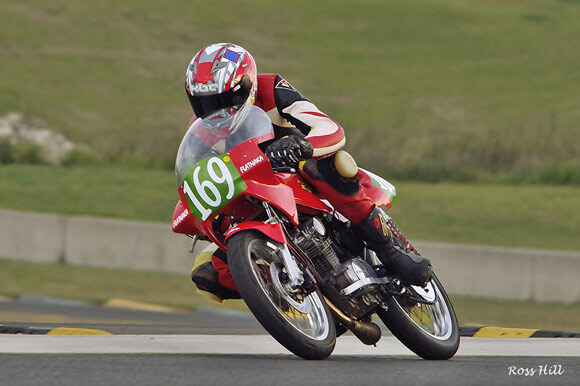 #169 Ian Gregory (Honda CB150) was in fine form at Eastern Creek winning two races and finishing 2nd to #8 Kurt Wagus (BBE Honda CB150) in the last race of the day. 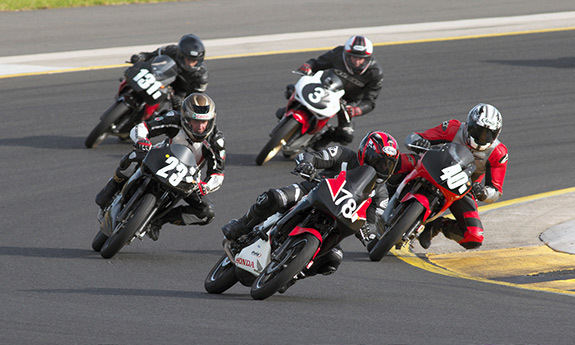 Ian Gregory (#169 Honda CB150) jumped into an immediate lead followed by #8 Kurt Wagus (BBE Honda CB150) and #38 Junior Murphy (BBE Honda CB150) in hot pursuit. #65 Tim Smith (Honda CB150) and #94 John Olip(Suzuki 100) were locked in a battle of their with John breaking free of Tim and hunting down Junior to pip him on the line for 3rd Place. 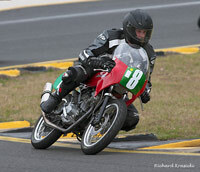 Tim Smith came in 5th and #62 Jim Murphy (BBE Honda CB150) came in 6th final finisher in the class. Race two got off to a similar start as the previous one but was missing #94 John Olip (Suzuki 100) who was out for the rest of the day as the little Suzuki had cried enough. #8 Kurt Wagus (BBE Honda CB150) was a lot closer to Ian this time but Kurt just could'nt close down Ian riding his flatnaka machine. Tim Smith had a lonely race in third. Junior finished fifth with Jim Murphy 6th. It was a determined Kurt Wagus that lined up for the start of race three and this time he was away to a perfect start with Ian firmly in his sights. Second time around Kurt was in the lead and next time it was Ian. Tim Smith was keeping a watching brief on the two up ahead but could'nt close on them. On the final sprint Kurt timed his move to perfection slipstreaming past Ian on the line winning by a mere seven hundreds of a second. This was Kurts first win in the Superlite PRO class after moving up to the class this year. Tim Smith came in 3rd to finish 3rd on the day. Junior and Jim Murphy followed on in that order. #120 Nathan Taylor (Suzuki 150) Won the day with 2 wins and a second place. 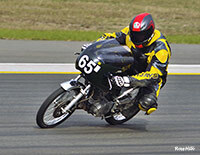 #56 Herman Wagus (Honda CB150) scored a win and 2 second places and finished second on the day. #31 Duncan Taylor (Suzuki 100) came in third. #3 Peter Lindsay runs in the Commuterlite class. With 2 of the main contenders missing from the line up only three bikes rocked up for the AM class. Class leader #56 Hermann Wagus (Honda150) fought a ding dong battle with newcomer to class #120 Nathan Taylor (Suzuki 150) and won by the tiniest of margins 10 thousands of a second. with #31 Duncan Taylor (Kawasaki KH100) rounding out the three positions. Nathan turned the tables on Herman in races 2 and 3 with the ever jovial Duncan 3rd. . The CommuterLite's popularity continues to grow. It's producing some great racing with some very talented riders emerging. The closeness of the racing is evident by the amount of races won and lost by thousands of a second. 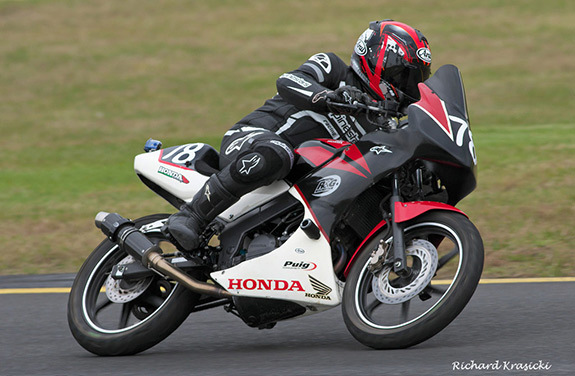 #75 Corey Smith (Honda CBR125) was in fine form to win all three races on the GP circuit at Eastern Creek. 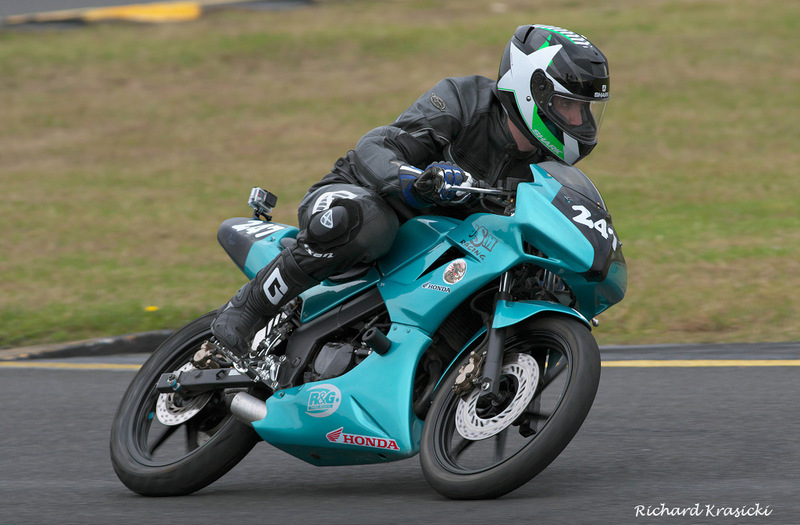 #555 Nicholas Miller (Honda CBR125) was his closest challenger with #23 Blair Briggs (Honda CBR125) a big improver. #75 Corey Smith (Honda CBR125)got a great start leading flag to flag. #555 Nicholas Miller (Honda CBR125)recovering from a slow start closed the gap to Corey ever so slowly and missed passing Corey for the win by a mere ten thousands of a second. Close finish's like this seem to the order of the day, if you want close racing go Bucket racing. 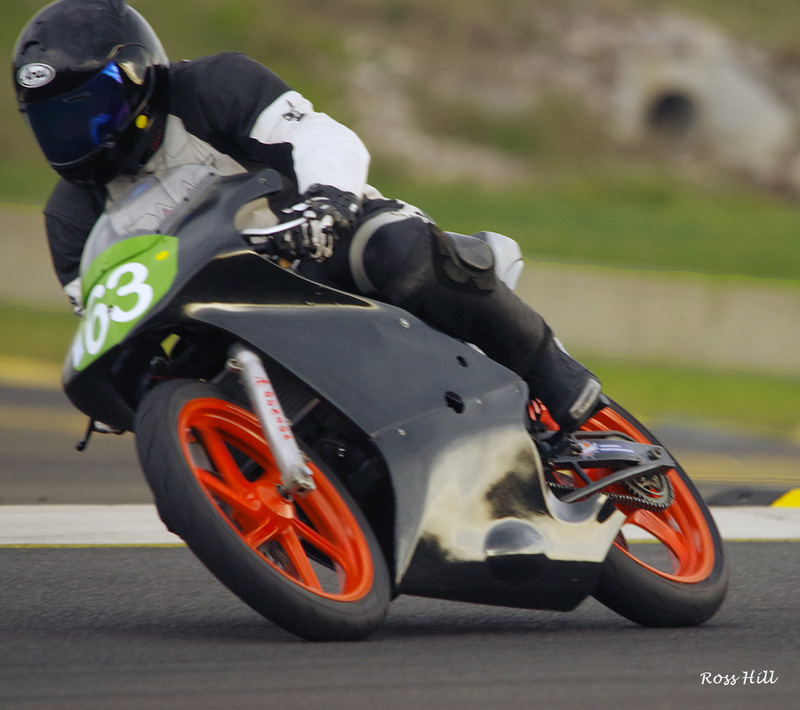 New to Commuterlite racing #23 Blair Briggs (Honda CBR125) and #40 Richard Cook (Honda CBR125) were locked in battle with Richard finishing third getting the upper hand in race one. #17 Adam Cameron (Honda CBR125) finished 5th. with #136 Ron Pulido (CBR125) a surprisingly lowly 6th for last years champion. 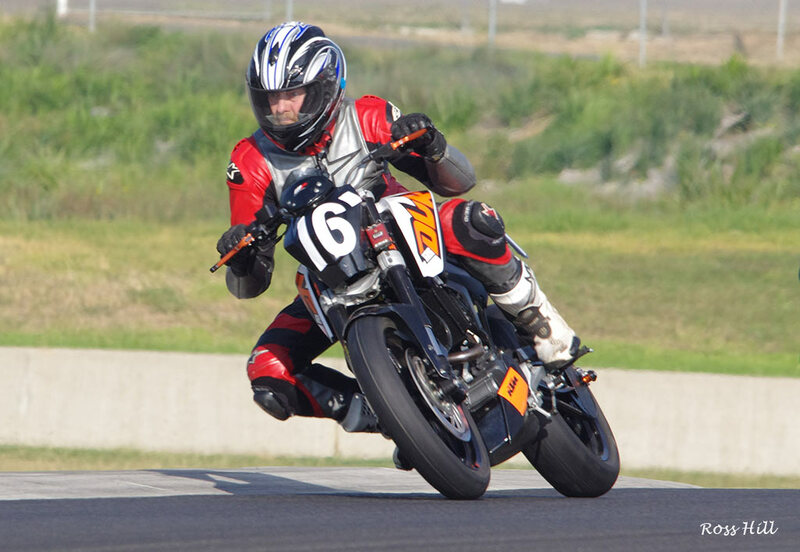 #16 Robert Young on the lone KTM125 7th. Giving his Superlite twin a rest and trying his hand at Commuterlites #4 Martin Kraaymaat (Yamaha YFZR125) finished 8th. on his first outing in the class. #17 Adam Cameron came home 5th. with #16 Robert Young (KTM125) 6th. Next came #4 Martin Kraaymaat (Yamaha YFZR125) and the out of luck Ron Pulido 8th. #75 Corey Smith once again jumped straight into the lead but #555 Nicholas Miller was much closer this time and moved past Corey on lap 3. On the last lap Corey re-passed for the lead and held it to the flag. Nicholas dropped a whole lot of places but recovered to finish in 4th place. #23 Blair Briggs and #40 Richard Cook resumed their earlier battles with Blair getting the upper hand to finish 2nd. with Richard 3rd. 555 Nicholas netted 4th with #17 Adam Cameron 5th. #136 Ron Pulido having bike problem finished 6th. #16 Robert Young (KTM125) 7th and #4 Martin Kraaymaat (Yamaha YFZR125) 8th. Rookie #78 Mark OToole (Honda CBR125) came to the fore at this meeting picking up a 2nd place in race one and winning races two and three after some very close and exciting racing with #131 Rez Pulido (Honda CBR125), #3 Peter Lindsay (Honda CBR125) , #22 Fil Pulido (Honda CBR125) and #48 Chris Woodhouse (Honda CBR125). #78 Mark OToole (Honda CBR125) got the start but second time around #131 Rez Pulido (Honda CBR125) had taken the lead which he held until the end. Mark came 2nd with #22 Fil Pulido (Honda CBR125), #48 Chris Woodhouse (Honda CBR125) 4th, #3 Peter Lindsay (Honda CBR125) 5th. and newcomer #247 Andrew Smith (Honda CBR125) tth. Next up #24 Tom Harrison (Honda CBR125) was followed home by #88 Jessica Dykes (Aprilia 125), #44 James Loveridge (Honda CBR125), #717 Lee Raynor (Honda CBR125) and #108 Frank Loveridge (Aprilia 125) . At the start #131 Rez Pulido got an early lead but had #22 Fil Pulido (Honda CBR125) #78 Mark OToole, #3 Peter Lindsay and #48 Chris Woodhouse in close company places changing at every corner. Lap three saw Mark go from 1st. to 4th but recover the lead on the last lap to take the win from #3 Peter Lindsay who had #131 Rez Pulido #22 Fil Pulido, #48 Chris Woodhouse and #247 Andrew Smith all jockeying for position and slipstreaming in the dash to the finish line. #24 Tom Harrison came home next followed by the 2nd group of riders #88 Jessica Dykes on the Aprilia 125 led #44 James Loveridge, #717 Lee Raynor and #108 Frank Loveridge home. This time it was #22 Fil Pulido who got the holeshot and a six way battle commenced with #78 Mark OToole, #3 Peter Lindsay, #131 Rez Pulido, #247 Andrew Smith and #48 Chris Woodhouse all jostling for position. Lap 2 Mark was in the lead wit Rez past Peter into 3rd. Lap 3 it was Fil back in the lead from Mark, Rez 3rd, Peter 4th, Chris 5th and Andrew Smith 6th. Last lap and the final corners and run to the flag was cliff hanger stuff. In the end Mark got his second win by 900th of a second over Rez who in turn had brother Fil on his tail, Chris Woodhouse pipped Peter Lindsay for 4th place by a tenth of a second with another fast improver #247 Andrew Smith 6th. #24 Tom Harrison comfortably led the next next group of riders #88 Jessica Dykes, #44 James Loveridge, #717 Lee Raynor and #108 Frank Loveridge all enjoying their own battles and having a lot of fun.